This post, Itinerary for an Eastern Hemisphere Education, was written for Sonlight Curriculum. Attention all passengers. Flight HBL is now boarding at Gate F! Get ready to fly across the Pacific to explore the Eastern Hemisphere with us! There will be some amazing sites to see, ethnic food to try, and new people to meet along the way, so be sure to follow our top travel tips for packing, organizing, and carry ons! Please feel free to list your passenger names and grades below in the comments, if you will be traveling with us! Ticket price: HBL F 5-day package is currently priced at $628.89 and includes SonlightCares™ perks. 4-Day tour package also available. Frequent traveler programs: Sonlight Rewards Program Enter ID #: MG20148372 to get $5 off your first purchase of $50 or more and share your rewards ID to earn rewards for you and your friends. Level F Instructor's Guide (IG). 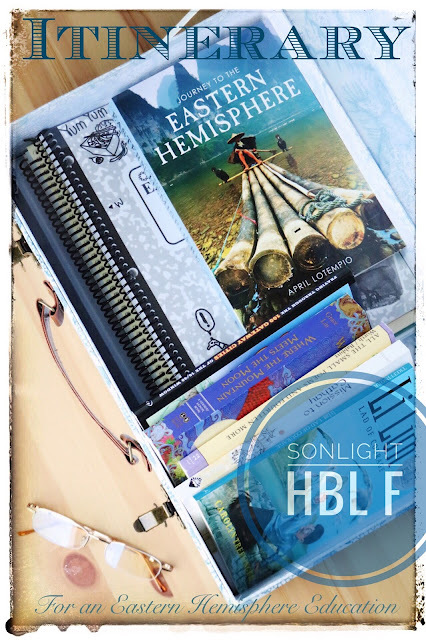 If you will be traveling with more than one student, you will need to purchase an extra Eastern Hemisphere Notebook Pages Set. 3" Binder with Tabs, Markable Map and Markers, and Timeline Book are required resources in addition to the tour package, if you don't already own them. If you will be traveling with more than one student, you may need to purchase a China Kit for each child. Your HBL F customized travel itinerary is awesome! It lays out every piece of information you may need on your trip so you are never left hunting around for a book or resource. This means you can spend more time exploring and relaxing and less time planning and organizing. It houses all the information you may need: books, 4 or 5-day weekly schedules in a teacher's guide with a fully planned-out schedule for 36 weeks of learning with book lists, notes, study guides, maps, timeline schedule, a detailed scope and sequence and schedule of topics and skills, and more. Your itinerary also contains a Quick Start Guide to make your travels as easy as possible. Please refer to this page if you are new to Sonlight, as well as the quick start information in your notes for Week 1 before you start. Each week of the schedule includes Bible and History notes, but the Read Aloud and Reader notes are in the back of the IG, so you may wish to pull the Read-Alouds and Reader guides out of the back of the IG for easy access. I spiral bound both guides along with the first six weeks of the IG, so I have everything I need in one carry-on. See How I Set Up Our Sonlight Instructor Guides to see more. You can also use a small binder as well, or work right out of the IG if you have desk space for it. I've done it all three ways, and they all work depending on the amount of space you have. The Timeline Suggestion schedule gives you tips on when to enter a name or event on your timeline. If you see a figure of a man on your schedule, this indicates that there is a figure in your packet to place on your timeline. The clock symbol indicates optional events you may want to add to your timeline as well. Your notes also include Map Points. These are indicated by a world symbol on your schedule and in your notes and give specific coordinates to easily find a location on the designated map. The schedule itself is laid out so you can know what to do each day with a quick glance. Write in it. Check off each assignment as you go. Make notes in the notes section or right in the margin. When you go through an Instructor Guide (IG) a second time, you will appreciate having those notes to look back on. I may be sentimental, but it brings a flood of happy emotions when I look back on these. For fun, use a date stamp to stamp the date that each week begins or ends. I also date stamp math pages, papers, and any other work my kids do. Color code your kids so when you go through an IG a second time, you can just use a different color pen to check off each box. My kids are the same colors in my IG and in my daily habit tracker. Make the schedule work for you - work down or across. We often work across the schedule when we are reading a book we can't put down. It can be hard to resist the plea to read just one more chapter! Resist the urge to be a box checker. You don't have to do it all, so don't be afraid to be a box slasher. I used to be a box checker. It can be overwhelming when you feel behind, but I needed a way to feel like I could move on, and a simple slash through the box, instead of a check, gave me the closure I needed. Add pictures, drawings, and samples of your student's work. Consider your IG a way to document your homeschool - a scrapbook of your homeschool journey. You don't have to record keep with Sonlight if you write in your IG and make it your own. My Sonlight IG's are like a scrapbook of our journey. I write notes right in my Sonlight IG's and date them. I slip artwork, samples of their work, and even photos or newspaper clippings right into my IG. I will probably go through the old ones and pull out samples and condense them eventually, but probably not until my kids are all out of the house, and I need a good cry. Couldn't resist the 5-day package, but want to squeeze it into 4 days like us? Read How to Schedule a 5-Day Program in a 4-Day Homeschool Week. I am unapologetic about being an overachiever in this area - I love all the books! But if I need to slow down, I will. Occasionally, we even add a sixth day to our week. I prefer our extra day to be at the beginning of the week on Sunday. It feels good to start Monday with our reading done for the day - I always feel ahead of the game this way! But, I often need to spread one week out over two, and that's fine, too! As a Sonlight ambassador, I will be your trusty tour guide through History, Bible, and Literature F. I promise to represent Sonlight and blog with utmost integrity and spirit of adventure, as Level F takes us where no other curriculum company ventures in this unique cultural journey to the Eastern Hemisphere. So please join us this school year for an excursion to countries, regions, and continents in the East, including the "10-40 Window" where the Gospel needs to be heard, mouths need to be fed, and people cared for. Let's shine a light in the darkness! Hi! I'm wondering what you think of the book Journey to the Eastern Hemisphere? I have had this core for years but it looks like this is a new book for this core and I'm wondering your opinion and if it's worth getting this book? Thank you! Thank you so much for your quick and detailed reply! I just discovered your site...loving it all so far...but I might need to read "being content with your curriculum" a few times-- so much there! Love also all the Biblical references everywhere...Thank you again! You're so welcome! And oh, me too! I need the reminder just as much as any other. I'm so glad you stopped by, Marcia!